After splitting the weekend with Mercyhurst, two Bulldogs have received weekly honors from their conference. The WCHA announced today that Ferris State defenseman Nate Kallen is the conference’s defenseman of the week, while teammate Hunter Wendt is rookie of the week. Ferris State beat Mercyhurst 5-2 Friday before falling 3-1 in the rematch, both of which were played in Big Rapids. 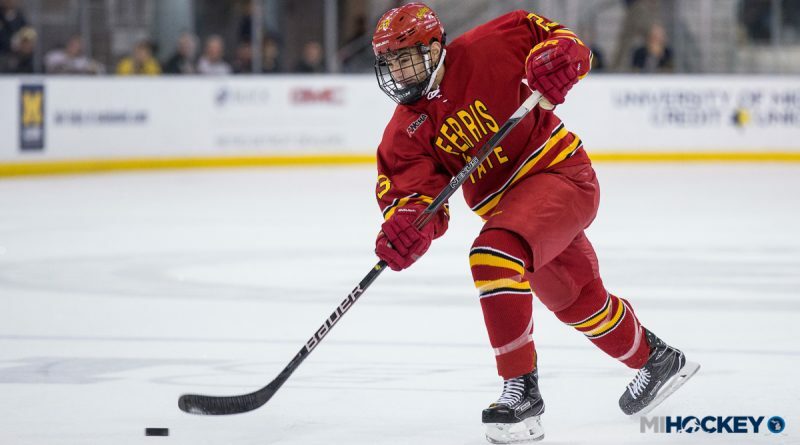 Kallen, a junior blueliner from San Diego, recorded a pair of assists, three shots on goal and five blocked shots on the weekend, as he helped Ferris State out-shoot Mercyhurst by a 68-39 count over the two games. Wendt, a freshman from Troy, recorded three points on the weekend, as he buried his first two collegiate goals and added an assist in the 5-2 win. Wendt also had 14 face-off wins and a blocked shot in the two games.